According to Chris Roberts, Star Citizen's fighters are so detailed that their real-world cost is in the thousands of dollars. Star Citizen recently became the most successful crowdfunding project of all time when its combined donations surpassed the $10 million mark. Some of you may have looked at that number and wondered how Chris Roberts could possibly spend it all, considering that most of Star Citizen's gameplay occurs in an empty void. To help answer that question, Roberts broke down the development cost of Star Citizen's spaceships, and you'll want to sit down because this one's a doozy. Roberts estimates that a single finished in-game fighter would be worth approximately $35,000 in real-world currency, while large carrier ships rate even higher. "[A single ship] can be anywhere from $35,000 to $150,000," Roberts explained. That figure accounts for everything from time and money spent modelling the item, to making sure each component part functions realistically. 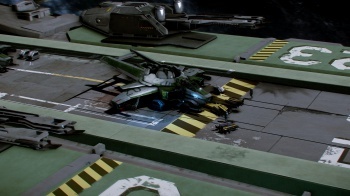 According to Star Citizen's campaign page for example, one fighter can consist of 300,000 polygons, while carriers can use up to 7 million. For comparison, the average character model in a Triple-A game uses 10,000 polygons. These numbers certainly aren't insurmountable, given Star Citizen's new budget, but it's still pretty shocking to learn how detailed the finished game might be. And that's just game models, without taking into account details like physics, ship interactions, lighting, or multiplayer servers. Here's hoping that Star Citizen's donors, including 35,000 Kickstarter backers alone, notice the difference their money made when the game launches in 2014.